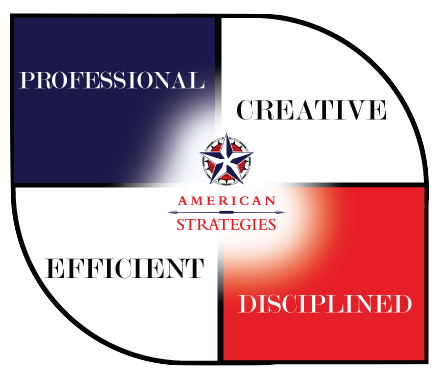 Founded in 2001, American Strategies is a national political strategy, campaign management and public relations consulting firm with offices headquartered in Columbus, Ohio with consulting partners in Washington D.C., Los Angeles, California and Chicago, Illinois. Our primary mission is to keep America strong by helping worthy causes and strong leaders to successfully navigate the dynamic environments of politics, government and business while making positive change for their communities and our country. The staff and strategic partners of American Strategies combine their decades of campaign and public affairs experience with the constant pursuit of new ideas, new technology and traditional research to provide you with innovative strategies and techniques that result in success. As your collaborative partner, American Strategies wants you to be more than a successful candidate; we want you to be an effective and energetic public servant. That’s why we’ll continue to assist you beyond Election Day. From helping you develop sound public policy to crafting public relations strategies, we’ll do everything we can to help you succeed not only today, but throughout your entire public service tenure.